Last year we wrote an article analysing the annual Independence March in Poland.1 This year marks the centenary of Polish independence. The nationalist frenzy is already in full swing, hundreds of events big and small are expected to take place throughout the country, including festivals, lectures, exhibitions and competitions. Accompanying this, a minor commodities boom – flags, t-shirts and books, commemorative coins and medals, peddled left and right. Meanwhile, the far right is preparing another Independence March (despite a ban by the Mayor of Warsaw and the President announcing a surrogate state-approved march). But in 1918 the future of Poland, and the whole of Europe, was far from certain – the spectre of social revolution hung heavy in the air. In the aftermath of revolutions in the Russian, German and Austro-Hungarian empires, states collapsed only to be reborn in new national colours. From 1917 the international working class was increasingly conscious of the need to find their own answer to the imperialist mayhem. Inspired by the events in Russia, workers’ councils spread throughout Europe, powerful strikes and demonstrations gave voice to those ignored by history. Workers’ councils were likewise established in Polish towns and villages.2 The more class conscious of these began to self-organise everyday life and challenge the power of the reconstructed Polish state. Divisions between socialists of the Polish Socialist Party (PPS) and the communists of the Communist Workers’ Party of Poland (KPRP) reached their zenith, as the former steered the councils to compromise with the nascent Polish state, while the latter, in the tradition of Ludwik Waryński and Rosa Luxemburg, anticipated a final showdown with the Polish bourgeoisie. For this centenary we have translated the following agitational leaflet distributed in Warsaw by the KPRP on the first anniversary of Polish independence. It was written at a time when communism meant true internationalism and working class self-organisation – not siding with this or that imperialist power, or falling for parliamentary cretinism. The KPRP, like the other parties of the Communist International, gradually degenerated over the 1920s to become tools of the Russian state. We have previously written about this process3 as well as the fight of the Polish Communist Left to keep the revolutionary programme alive.4 But in 1919 the party was crystal clear on this, there were only two options: an independent Polish state, with the bourgeoisie on top, or the power of the Workers’ Councils, with the working class taking its future into its own hands. By now it should be obvious that Polish independence did not solve the national question, let alone the social question. Not only that, many of the problems raised by the leaflet remain ever relevant. Profiteering, corruption, attacks on workers’ and human rights, evictions, nationalist hatred and chauvinism, are all ripe in the Poland of today. History has shown those socialists who promised national liberation would deliver socialism to be wrong.5 The Polish nationalism of today is a direct continuation and consequence of the nationalism which crushed the workers’ movement in years 1918-23. 6. This refers to German Emperor Wilhelm II (1859-1941) and Charles I of Austria (1887-1922). 7. Frak refers to a member of the Revolutionary Faction of the PPS. In the aftermath of the 1905 revolution the PPS split, with the fraks on one side and the PPS-Left on the other. The fraks prioritised national independence over socialist revolution. The fraks returned to the name PPS in 1909, while the PPS-Left merged with the SDKPiL to form the KPRP in 1918. Both the Chief of State Józef Piłsudski (1867-1935) and the first Prime Minister Jędrzej Moraczewski (1870-1944) belonged to the fraks. 8. 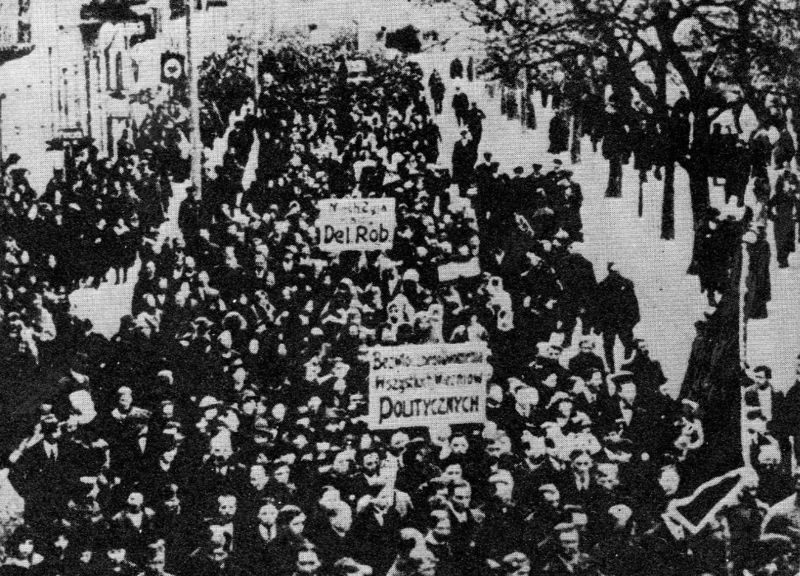 The demonstration in Warsaw on 29 December 1918 was called by the KPRP in protest against the arrest of the Red Cross emissaries and the state repression in the Dąbrowa Basin. The gendarmerie opened fire on the demonstration killing between three to ten participants (sources vary) and injuring many more. 9. On 20 December 1918 five emissaries from the Red Cross of the Soviet Russia arrived in Warsaw to negotiate the repatriation of Russian POWs from Poland. They were interned, accused of being communist spies, put in prison and then expelled from the country. On 3 January 1919, as they were being escorted towards Soviet Russia, the Polish gendarmerie dragged the emissaries into a forest and murdered them. Four were killed on the spot, but Leon Alter (1889-1934) managed to escape. Although shot in the neck, he reached Minsk and revealed what had happened. The murder of the emissaries took place not far from the village Łapy, where just a few days later another Polish communist, Zbigniew Fabierkiewicz (1882-1919), was murdered by the gendarmerie. ...bourgeois “independence” is the brutal dictatorship of the bourgeoisie over the proletariat.